Annual, biennial, or short-lived perennial herb from coarse, fibrous roots; stems single, erect, 20-60 (90) cm tall, simple or few-branched, stiff-hairy or nearly smooth, hollow. Basal heart- to kidney-shaped, 3-parted to deeply 3-lobed, the blades 2-6 cm long, 3-8 cm wide, the segments again lobed, the ultimate segments elliptic to lanceolate, margins few-toothed, tips pointed to rounded or blunt, the stalks up to 20 cm long; stem leaves few, alternate, the upper transitional to linear-lanceolate bracts. 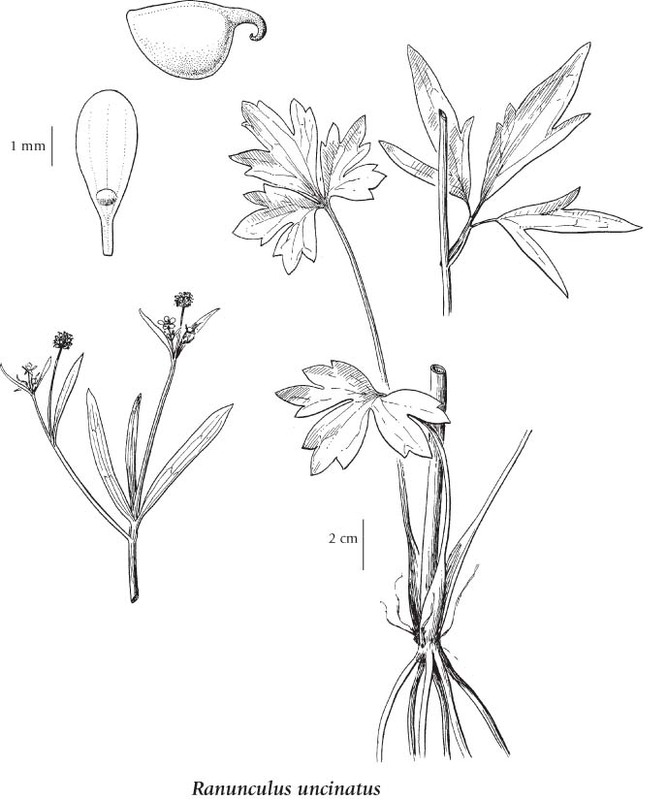 Inflorescence of few-flowered terminal and axillary cymes; flower stalks to 6 cm long; receptacle smooth; petals 5, distinct, yellow, 2-4 mm long, 1-2 mm wide, nectary on upper surface, the nectary scale as wide as long, smooth; sepals 5, bent back or sometimes spreading, 2-3.5 mm long, 1-2 mm wide, early deciduous, hairy; stamens 10-20; pistils (5) 10-30. Achenes, several to many in a globe-shaped head 4-7 mm long, 4-7 mm wide, the achenes egg-shaped, 2-2.8 mm long, 1.6-2 mm wide, smooth or sparsely stiff-hairy, margins prominent, keeled; beaks persistent, lanceolate, 1.2-2.5 mm long, curved and hooked. Recognition of infraspecific entities does not appear warranted. Moist meadows, streambanks and open woodlands in the lowland, steppe and montane zones; common in BC south of 56degreeN, rare in NW BC; N to AK, E to AB and S to NM, AZ and CA. A shade-intolerant, submontane to subalpine, Asian and North American forb distributed more in the Pacific than the Cordilleran region. Occurs on fresh to very moist, nitrogen­rich soils within boreal, wet temperate, and cool mesothermal climates; its occurrence decreases with increasing elevation. Tolerates flooding and fluctuating groundwater tables. Occasional on exposed mineral soils in forest openings or open-canopy broad-leaved forests on water-receiving sites; commonly inhabits recently deposited organic matter-rich alluvium. A nitrophytic species characteristic of Moder and Mull humus forms.